Karijini Eco Retreat is located off Weano Road in Karijini National Park. Driving north on the North West Coastal Highway to Nanutarra Roadhouse (370kms) 5kms after the roadhouse, turn right on to the Nanutarra - Wittenoom Road. After 219kms turn right to Paraburdoo, 51kms. After Paraburdoo continue towards Tom Price for 70kms. 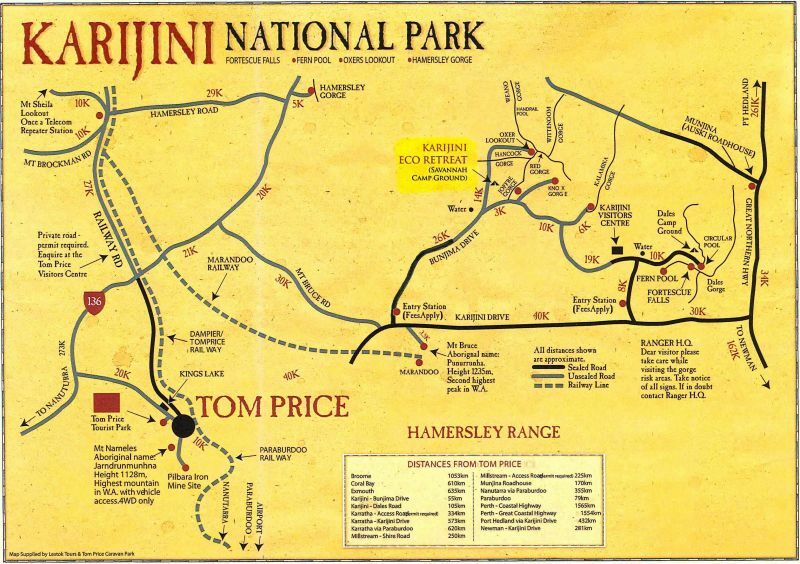 10 kms before Tom Price, turn right at the Karijini Drive Road, signposted to Karijini National Park and Warlu Way. Just before Marandoo mine, 40 kms, turn left as signposted towards Karijini National Park. The 2nd road on the left approx 5kms, is Banjima Drive and western entry point to the Karijini National Park. Turn left here and travel on sealed roads to the 3km unsealed, but graded, access road into Karijini Eco Retreat. Driving South on the North West Coastal Highway for 42 kms . Turn left on the Great Northern Highway towards Newman / Perth . Travel on this highway past Auski Roadhouse 219kms - (last fuel point before the National Park ) .After 35 kms, turn right onto Karjini Drive. Signposted to Tom Price. First road on right is Eastern entry point to Karijini National Park , Dales Gorge and the Karijini Visitors Centre. Follow signage to the Karijini Visitors Centre ( on Banjimi Drive ) and continue on this unsealed road for a further 30kms . Turn right at the T intersection into Weano Gorge Road . Travel 3kms to the Entry to Karijini Eco Retreat . Alternatively, continue on Karijini Drive to the western entry point into the park and travel on sealed roads to the 3km unsealed, but graded, access road into Karijini Eco Retreat.